Go to Khan Academy http://www.khanacademy.org/science/chemistry/introduction-to-the-atom and watch the two videos on the page. Elements and Atoms: How elements relate to atoms. The basics of how protons, electrons and neutrons make up an atom. Remember to write notes and questions as explained in "Expectations"
Go to Khan Academy http://www.khanacademy.org/science/chemistry/periodic-table-trends-bonding and watch the following videos on the page. Groups of the Periodic Table: Properties of alkali, alkaline earth and transition metals. Halogens and noble gases. Valence Electrons: Looking at valence electrons to figure out reactivity. Ionic, Covalent, and Metallic Bonds: Introduction to ionic, covalent, polar covalent and metallic bonds. Write the numbers of electrons in each shell. Put a comma to signify a different energy shell. Divide the job between the team members. Do this in the first twenty squares for elements with atomic number to 20. On your large Periodic table label the the Periods 1 to 4. Use the diagram to the left to explain what the period numbers mean. On your large Periodic table label the the Groups 1 to 8. Look at the outer electron shell and explain what the Group numbers mean. Aim: To test and compare the appearance, malleability, hardness and electrical conductivity of some metals and non-metals. Read through the group worksheet. 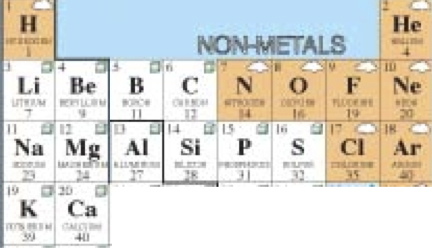 Draw up a Results table; Observations of physical properties of metals and non-metals. The class will perform this practical as a caucus race with ten minutes at each of four stations. We will organise how to do this in class. Leave your station neat and ordered for the next group.